Back in the arena, Charlotte is the first woman to make her way to the ring, and she gets a pretty nice reaction from the Detroit audience. Natalya is out next, and the Champion makes her way quickly to the ring, getting into position for formal ring introductions. The bell rings and we get a lockup right away with Charlotte rolling Natalya up for a one count. Natalya backs Charlotte into the corner and breaks with a little shove. Charlotte rolls up Natalya for a two count, then blasts her with a forearm to the face. Charlotte struts a bit and Natalya slaps her across the face. Natalya tries for the Sharpshooter, but Charlotte fights it off and slaps Natalya. Natalya is able to takes Charlotte to the mat and she focuses on the leg, stomping on the ankle and kicking the back of the knee. Natalya stomps on Charlotte's knee in the corner before being backed away by the ref. Natalya picks up Charlotte and pulls her down with a dragon screw into a knee bar. Natalya wrenches back and Charlotte screams in pain. 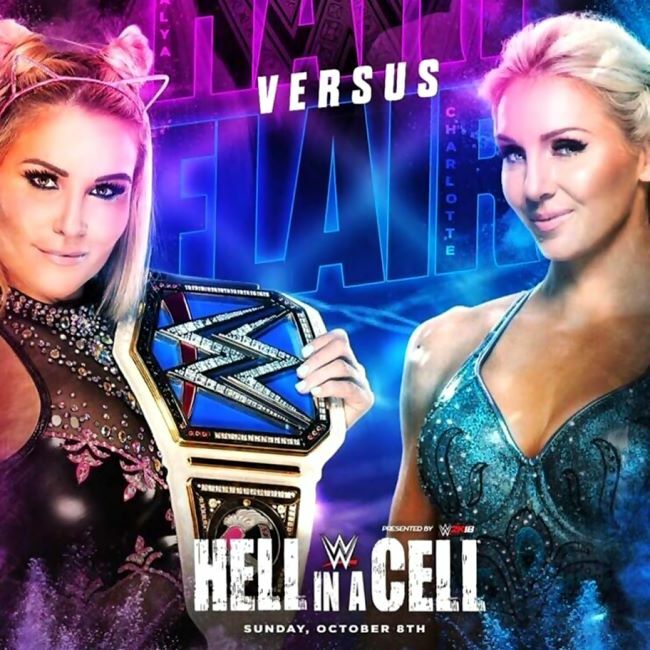 Charlotte is able to kick Natalya in the face to break the hold, but Natalya connects with a chop block to the back of the knee to take Charlotte down again. Natalya kicks Charlotte in the gut and she ties up her legs in a submission, pressing down on Charlotte's knees to inflict damage. Charlotte is able to turn the hold over and Natalya grabs onto the ropes to force a break. Natalya goes right back to work on Charlotte's leg, before she slams her face first into the mat. Natalya picks up Charlotte by the foot and drives her knee into the mat. Natalya tries to drive the knee into the mat again, but Charlotte pops up to her feet. Natalya connects with an immediate discus clothesline. Charlotte begins to fight back, and she avoids a flurry of offense from Natalya in the corner. Charlotte connects with a couple of big chops to the chest before taking Natalya to the mat. Charlotte drops a knee across the back of Natalya's neck with her good knee. Charlotte suplexes Natalya, then she tries to head to the top, but she's stopped by Natalya. Natalya pulls Charlotte out of the corner and powerbombs her in the middle of the ring, hanging on for a pin. Charlotte is able to kick out at two. Natalya goes for more and more pin attempts, continuing to get two counts. Charlotte rolls up Natalya for a two count, and Natalya connects with a series of right hands. Natalya hits the ropes and goes for the discus clothesline, but Charlotte connects with a big boot instead. Charlotte goes for the Figure Four, but Natalya kicks her to the outside instead. Natalya slides to the floor and she shoves Charlotte into the ring steps, making sure her knee connects with the steps. Natalya brings things back into the ring and she is able to lock in the Sharpshooter in the middle of the ring. Charlotte crawls toward the ropes, but Natalya pulls her back. Charlotte is able to roll through and the back of Natalya's head connects with the bottom turnbuckle. Charlotte pulls Natalya back and she goes up to the top rope, but Natalya rolls out to the floor. Charlotte drops down and kicks Natalya in the face. Charlotte heads out to the apron and she climbs up to the top rope once more. Charlotte launches herself off with a moonsault out to the floor, and Charlotte screams in pain, grabbing at her knee before she tries to move things back into the ring. Natalya avoids being thrown back into the ring, and she grabs a chair, using it to blast Charlotte in the stomach. Natalya hits Charlotte with the chair repeatedly, refusing to let up. After the bell, Natalya delivers another chair shot and works Flair over with it, focusing on her injured knee. Fans boo. Natalya grabs her title and raises it over Flair on the floor. Flair sells the injury as Natalya calls her pathetic. Natalya delivers another cheap shot and walks off with the title as fans boo. The referee checks on Flair and calls for help as we go to replays. Natalya raises the title on the ramp as Flair is announced the winner. Natalya retains.